Those who are pure in heart will see My face. In the Old Testament, a person could not look on the face of God and live to tell about it. Even Moses, who was one of God's closest friends, couldn't look at the Lord's face and live. 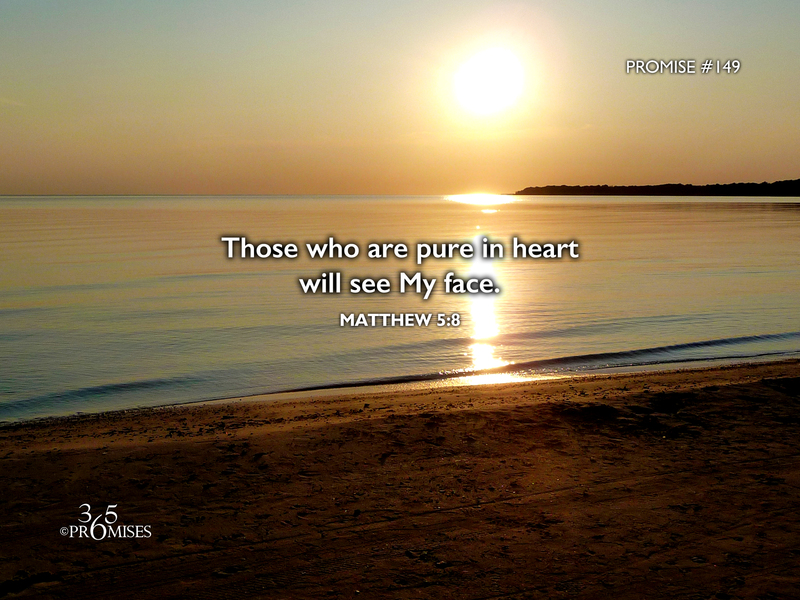 Yet in this passage from the Sermon on the Mount, Jesus tells us that those who are pure in heart will see God face to face. The reason that we will be able to see God and not be consumed is because of Jesus and the price that He paid so that His life would become our life. Because of His death and resurrection, His righteousness has now become our righteousness. The Bible says that we are hid with Christ in God right now! (Colossians 3:1-3) Jesus' holiness has now become our holiness and Jesus' Father has now become our Father (John 20:17). My prayer today is that the Spirit of God would make the benefits of our salvation more real to us today than ever before. Because of Jesus, we now have access into the throne room of God 24/7 without the fear of being consumed. We can boldly approach our God and Father with confidence night or day, because we have full access to Him in Christ! ...Blessed are the pure in heart for they shall see God!